Much was made of Olli Jokinen's hot start with Calgary after the Flames acquired him from Phoenix at the trade deadline. 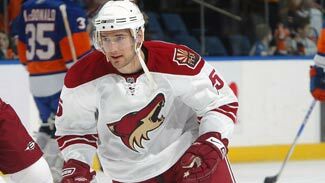 But the Coyotes are more than happy with forward Matthew Lombardi, the key player they got in return. The presences of top-six forwards such as Jarome Iginla, Daymond Langkow and Michael Cammalleri pushed Lombardi into more of a checking role and limited his ice time. But the trade to the Coyotes has opened up a whole new world for Lombardi, who's getting about five minutes more per game in Phoenix than he was in Calgary -- and thriving on the extra work. "I think he loves it," coach Wayne Gretzky said. "I am probably giving him more power-play time than he saw in Calgary, but he has earned that right. He has played hard and he doesn't cheat the game. With a young team, you try to send the message that guys who play hard and compete every shift are going to get opportunities, and that's what he does." Lombardi had 5 goals and 13 points in his first 16 games with the Coyotes after going 9-21-30 in 50 games with Calgary. He's also providing leadership for a young team. "I am not a big vocal guy," Lombardi said. "I definitely enjoy being with the guys and I think we have a real lively group here, which is fun. For me, it's just going out there and doing my job, and that's the way I can bring my leadership." Lombardi was the Flames' third-round pick in the 2002 Entry Draft and played more than four seasons in Calgary -- a place where players become instant celebrities but seemingly have every move analyzed and scrutinized. "Calgary is a great hockey town," Lombardi said. "You'd get recognized because it's not a very big city, but I am really enjoying everything there is about being in Phoenix and the quality of life and, more importantly, my family seems to love it right now." Lombardi said getting a little less attention from fans and media can be a good thing. "It's definitely nice not to be under the microscope as much," he said. "I can't really say which one is better because they are different. When you are playing in a market like that you deal with it. Guys that really like the attention would miss it, but I am not one of those guys." One reason the San Jose Sharks entered the final week of the regular season in the driver's seat for the Presidents' Trophy (they led Detroit by four points in the West and Eastern Conference leader Boston by three) is that their power play is really producing. San Jose scored twice with the man advantage Sunday night in a 3-2 win at Anaheim, extending the Sharks' franchise record for scoring a power-play goal to 11 games. The extra-man goals were especially important earlier in the week when the Sharks won back-to-back 2-1 victories at Calgary and Edmonton -- the first time they've swept a trip to Alberta. At 24.5 percent, San Jose entered the week with the NHL's third-best power play, trailing only Detroit and Washington. "The power-play units have been a threat each time they go on the ice," coach Todd McLellan said. The Sharks have been piling up power-play goals without a lot of opportunities. They've scored 13 goals during the streak on only 37 chances, a 35.1 success rate. San Jose has also thrived despite the absence of some key players: Defenseman Rob Blake and forward Patrick Marleau both missed multiple games (Marleau sat out the last four with a lower body injury). "It shows how important the system is," Blake said. The Sharks' power play also excelled during their record-setting hot streak at the start of the season. But McLellan has made changes throughout the season. "We've made a few adjustments and changes in personnel," the first-year coach said. "You can't have who you started the year with at the end of the year. You have to evolve. Other teams are watching video and you have to try and stay ahead of the curve." Bittersweet ending -- When is a victory a loss? If you're the Dallas Stars, it's when you win your season finale in overtime, only to be eliminated from the playoff race because the opponent, the St. Louis Blues, left town with a point for the OT loss. Trevor Daley's goal 16 seconds into overtime won the game for the Stars, but the single point for the Blues officially eliminated Dallas from the playoff hunt with three games (all on the road) this week. "Obviously, we play all these games to play in the postseason, and when you're not given that opportunity, it's disappointing," Daley said. "At the end of the season, we're going to look back and reflect on it, and we're going to be upset about what happened." The injury-riddled Stars started slowly, got hot for a while and were actually as high as fifth in the Western Conference before going 6-13-3 in their last 22 games -- and 3-9-1 in their last 13 at home. They finished the season 1-3-0 against the Blues and were outscored 18-9 in the four games. "It's been bittersweet for a while now," Stars coach Dave Tippett said of the club missing the postseason for the first time since 2002 and just the third time since moving to Dallas in 1993. "You focus on the last few weeks and you make the playoffs by playing well all year. We were too inconsistent over the course of the year to give ourselves a chance. We had too many struggles over the season that didn't allow us to push through." The injury bug even caught up with ironman goaltender Marty Turco, who was forced to sit out the game with a lower body injury. Dallas recalled 26-year-old Matt Climie from Idaho of the ECHL and gave him the start against the Blues. Climie, who signed with the Dallas organization as a free agent last summer, made 22 saves to win his NHL debut. "It was quite the experience," said Climie, who became the fifth Dallas goaltender to win his NHL debut (Mike Torchia, Roman Turek, Dan Ellis and Mike Smith were the others). "It was definitely just surreal, I guess. (Nervousness) wasn't too bad until I started looking around and seeing how many fans and the big Jumbotron and everything, then the butterflies came." Big night for a big man -- Los Angeles rookie Brian Boyle is known mostly for his size -- at 6-foot-7 and 252 pounds, a first-round pick by the Kings in the 2003 Entry Draft is tough to miss. However, he wants to be known for more than just merely being big -- and a few more showings like the one he had against Phoenix on April 4 will help. Boyle had the first two-goal game of his brief NHL career against the Coyotes, leading Los Angeles to a 6-1 victory. "It was a great feeling to be able to help out, we've been having trouble scoring goals" said Boyle, who's still trying to become a full-time NHL player. He has three goals in five games since being recalled from Manchester of the AHL on March 27. "I am trying to stay here for the rest of the year and hopefully string a few good games together," said Boyle, who had 4 goals in 8 games with the Kings in 2007-08 and has 4 in 24 games during a series of call-ups this season. Boyle scored twice in the first 14:52, scoring on an assist from Kyle Calder at 7:02 and getting an unassisted goal at 14:52. Kings coach Terry Murray has been looking for offense all season, so there will be an opening for Boyle if he can produce. "It was real important for him to have a good game here and we have been pushing him pretty hard in our meetings," Murray said after the win over the Coyotes. "He has good hands and everyone knows that and when he gets in those situations he can do some damage down low." Paying for their reputation -- The Anaheim Ducks have a reputation as one of the NHL's toughest teams. Unfortunately for the Ducks, they've occasionally had to pay the price. The Ducks had the biggest disparity in power plays last season and entered the final week of the season at minus-74 (301 power plays; 375 disadvantages). The numbers have been even tougher recently -- the Ducks had just four power plays in their last three games while having to kill 14. "To some degree, I think, the reputation that we've had historically is hurting us in these situations," Coach Randy Carlyle said after Sunday's 3-2 loss to San Jose, a game in which the Ducks had just two power plays while the Sharks were awarded seven. "We're not saying we haven't committed fouls.When we've played in the offensive zone as much as we have and watch what other teams do to defend our players and if we do the same thing it doesn't seem that there's an equal playing field at times. But that's perception . . . and you have to take that into consideration"
Carlyle concedes that the Ducks' reputation for being physical sometimes works against them. "We're not saying we haven't committed fouls," Carlyle said. "When we've played in the offensive zone as much as we have and watch what other teams do to defend our players and if we do the same thing it doesn't seem that there's an equal playing field at times. "But that's perception . . . and you have to take that into consideration." Despite the power-play disparity, the Ducks have been one of the NHL's hottest teams, winning eight of their last 10 to move into seventh place in the West. But they'll spend most of this week sitting and watching. The Ducks don't play again until Friday night, when they host Dallas in their final regular-season home game. They conclude their season Saturday in Phoenix. "It's tough, but it's nice that we get a little bit of a break before our last two games, especially this late in this season," forward Corey Perry said. "We've been playoff hockey for the last couple of weeks here. It's been a long haul and we're in a great position where we are. It's our destiny. We have to come out and prove that we belong there. We have to ready for Friday. It's going to be a test, especially with these days off. We have to be prepared." Ice chips -- It's hard to have a better start to your NHL career than the one Phoenix goaltender Al Montoya enjoyed. He became only the fifth NHL goaltender to post a shutout in his NHL debut when he blanked Colorado 3-0 on April 1, then beat Los Angeles 2-1 the next night. In all, he stopped 43 of 44 shots. Montoya's magic ran out in his third game, when the Kings got even with a 6-1 win. Still, Montoya is showing GM Don Maloney, who acquired the former first-rounder from the New York Rangers last year, that he has to be considered for a job next season. 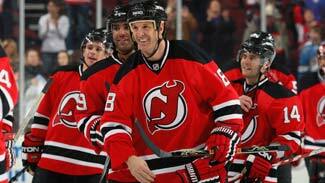 ... Coyotes captain Shane Doan scored his career-best 31st goal in the loss at Los Angeles. But with another early summer looming, he said afterwards that he "would definitely take 21 goals (instead) and be in the playoffs than 31 and out." ... With 36 goals entering the final week of the season, Loui Eriksson has scored more goals than any Dallas Star since current co-GM Brett Hull notched 39 in 2000-01. Eriksson is 8-9-17 in his last 18 games. ... Stars players were called into a team meeting on April 4 at which they received a Stars flag that had been flown in Iraq by the Air Force National Guard squadron from Garland, Texas. The flag, flown over the Kirkuk Regional Air Base in Iraq by the 221st Combat Communications Squadron, was raised on July 22, 2008, and flown for the day before being taken down and signed by all the members of the squadron. ... The San Jose chapter of the Professional Hockey Writers' Association selected Claude Lemieux as its nominee for the Masterton Trophy, awarded to the player who best exemplifies the qualities of perseverance, sportsmanship and dedication to hockey. Lemieux, 43, returned to the NHL with the Sharks this season after being out of hockey since 2003. ... San Jose will finish with the most wins and points in franchise history. The Sharks won their franchise-record 52nd game Sunday night in Anaheim and had 115 points with three games remaining. ... Thomas Hickey, the Los Angeles Kings' first pick in the 2007 Entry Draft, scored his first professional goal on April 4 in Manchester's 3-2 AHL loss to Worcester. Hickey signed with the Kings after Seattle, his junior team, was eliminated from the Western Hockey League playoffs. ... Anaheim has helped itself on the power play during its recent hot streak, going 9-for-25 (36.0 percent). They are 16-for-38 (42.1 percent) in their last 11. ... Ryan Getzlaf's assist against the San Jose Sharks on Sunday gave him 90 points for the season, a level reached by only two other Ducks -- Teemu Selanne and Paul Kariya.